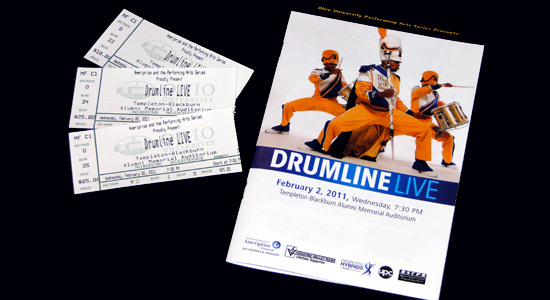 This evening Mom, Sarah and I went to see Drumline: LIVE at the Ohio University Templeton-Blackburn Alumni Memorial Auditorium in Athens. I was expecting a show that told the story as in the movie. But we were all very pleasantly surprised to see performance that was entirely musical. It was a high-energy concert. The show was presented in segments that highlight different types of music. There were African, swing, gospel, hip-hop and others. They also performed tributes to the great artists of Motown Records and Michael Jackson. Sarah's favorite piece was done in the dark with fluorescent lights on the drummers and lighted drumsticks. Another amazing selection was the drumline battle that had some seemingly impossible moves. We loved the show. They rocked Memorial Auditorium.